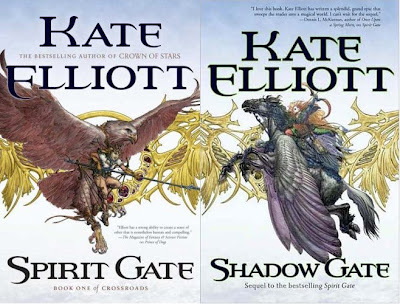 Fantasy Book Critic: Winners of the Kate Elliott/Crossroads Giveaway + Misc. News! Winners of the Kate Elliott/Crossroads Giveaway + Misc. News! In book news, Stephen Baxter’s short story “Last Contact” has been shortlisted for the 2008 Hugo Award. In celebration of this achievement, Solaris Books—who originally printed the short story in The Solaris Book of New Science Fiction anthology edited by George Mann—have decided to make “Last Contact” available online for FREE. So be sure to take this opportunity and read “Last Contact” HERE. In other news, “Street: Empathy”, the debut novel by UK-based cyberpunk novelist Ryan A. Span, has been released by Gryphonwood Press. Span is the author of the popular online serial Street of Eyes. “Street: Empathy” comprises the first year of the online serial, and includes a preview of year two. Span says of his debut novel, “If you like dark science-fiction, you'll like it. If you like cyberpunk in particular, you've hit gold.” Street: Empathy is Gryphonwood's sixth release. Other titles include “The Silver Serpent” (Reviewed HERE) by David Debord, “Seabird” by Sherry Thompson, “Dourado” by David Wood, “An Old-Fashioned Christmas” by James Weidman, and the anthology “Stories From the Inkslingers”. Moving on, Bragelonne, the leading French fantasy publishing house, and Gollancz, an imprint of the Orion Publishing Group, are delighted to announce that Pierre Pevel’s dragon fantasy sequence, beginning with “Les Lames du Cardinal”, will be translated and published in English in 2009. 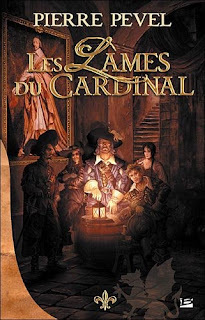 The first adult French fantasy novel to be translated into English, “Les Lames du Cardinal/The Cardinal’s Blades” is a superb swashbuckling novel set in a vividly realized seventeenth century Paris where intrigue, duels, spies and adventure are rife and Cardinal Richelieu’s men may be prevailed upon to risk life and limb in the name of France at a moments notice. And the defense of France has never been more pressing. A threat is growing in the south – a threat which would see a huge dragon-shaped shadow cast over France, quite unlike the little pet dragonets which roam the cities like stray cats, or the tame wyverns men can ride like horses high above the Parisian rooftops. These dragons and their descendents are ancient, powerful, terrible . . . and their influence is spreading. 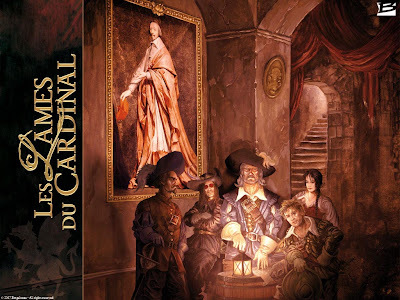 It’s up to Captain La Fargue and his elite group of men, the Cardinal’s Blades, to stop them – or to die in the attempt. Pierre Pevel, born in 1968, is one of the foremost writers of French fantasy today. The author of seven novels, he was awarded the Grand Prix de l’Imaginaire in 2002 and the Prix Imaginales in 2005, both for Best Novel. He's also Ian Fleming's James Bond series French translator and an expert on TV series scriptwriting. “Les Lames du Cardinal” is also sold in Germany, the Netherlands, Spain, the Czech Republic and Russia. Sounds a little bit like Naomi Novik’s Temeraire novels and I’m definitely intrigued. I wonder if it will get published in North America? 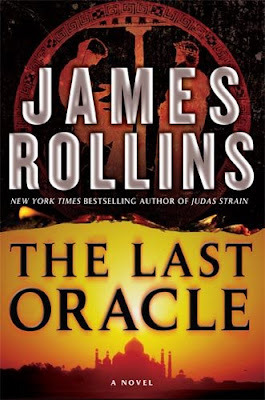 Lastly, if you’re a fan of the author James Rollins—also writes fantasy under the pen name James Clemens—like I am, then be sure to stop by The Signed Page who is offering preorders for signed copies of both James’ novelization of the upcoming movie Indiana Jones and the Kingdom of the Crystal Skull and his new Sigma Force adventure “The Last Oracle” (Release Date: June 24, 2008)!!! 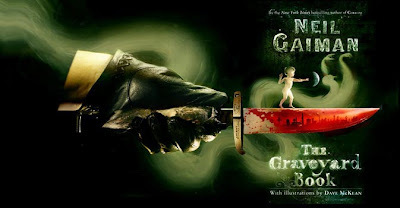 Oh, one last thing :) I just happened across this little blog called Cover Out Loud that features books covers and thought some readers might be interested in it, particularly the various artwork on display for Neil Gaiman’s forthcoming release “The Graveyard Book” (Fall 2008). Like the image above for instance ;) So definitely check it out! Very interesting news. I'm curious about the french book, because in my childhood I loved the works of Alexandre Dumas. Now a cross between that kind of works and fantasy should be an interesting read. Here's the correct link for Last Contact. the link in the post doesn't work.